Nature does not only work mechanically, but by such excellent and most compendious as well as stupendous contrivances, that it were impossible for all the reason in the world to find out any contrivance to the same that should have more convenient properties. Take a ride down into one of your cells, let’s say a heart muscle cell. Its rhythmic contractions are powered by ATP, which is flooding out from the any large mitochondria…Shrink yourself down to the size of an ATP molecule, and zoom in through a large protein pore in the external membrane of a mitochondrion. We find ourselves in a confined space, like the engine room of a boat, packed with overheating protein machinery, stretching as far as the eye can see. The ground is bubbling with what look like little balls, which shoot out from the machines, appearing and disappearing in milliseconds. Protons! The whole space is dancing with the fleeting apparition of protons , the positively charged nuclei of hydrogen atoms. No wonder you can barely see them! Sneak through one of those monstrous protein machines into the inner bastion, the matrix, and an extraordinary sight greets you. You are in a cavernous space, a dizzying vortex where fluid walls sweep past you in all directions, all jammed with gigantic clanking and spinning machines. What your head! 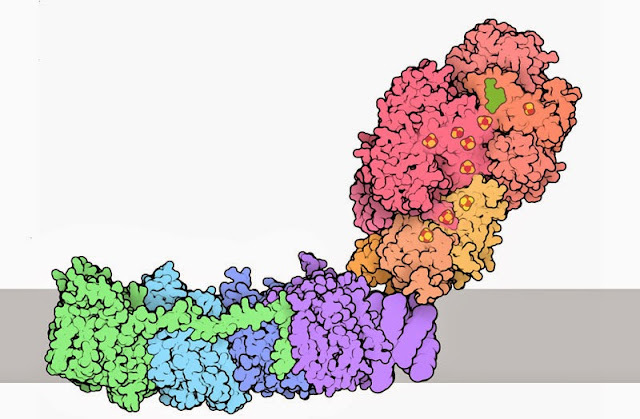 These vast protein complexes are sunk deepening into the walls, and move around sluggishly as if submerged in the sea. But their parts move at amazing speed. Some sweep back and forth, too fast for the eye to see, like the pistons of a steam engine. Others spin on their axis threatening to detach and fly off at any moment, driven by pirouetting crankshafts. Tens of thousands of these crazy perpetual motion machines stretch off in all directions, whirring away, all sound and fury, signifying…what?